Governor Kitzhaber in a photo on his official website. 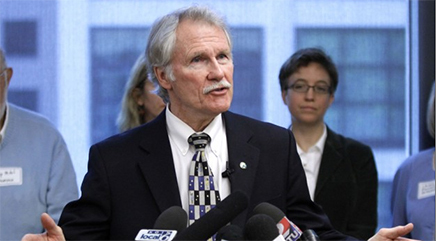 Governor Kitzhaber has worked on health care and insurance reform since the 1980s. It’s what he is known for. He’s supposed to be the expert. When he was out of office during the Kulongoski years, he gave impressive speeches on his vision of how medical costs could be curtailed and insurance coverage be provided for all. But something went haywire when the various concepts attempted to be carried out in the last two or three years. We have a bewildering array of government and quasi-government organizations in Oregon, all with their hands in health care or insurance, in addition to the providers and the insurers and the insurance commissioner. We have the Oregon Health Authority, the Oregon Health Policy Board, the Oregon Health Plan, the Division of Oregon Medical Assistance Programs, and on the regional level we have Coordinated Care Organizations. Now, on top of all that, we have Cover Oregon, a public corporation responsible to a board appointed by the governor. So even a policy wonk like Kitzhaber might have lost sight of all the intersecting lines of responsibility. Maybe that accounts for the expensive failure so far of Cover Oregon to function as intended in signing people up for insurance online, and for Kitzhaber’s failure to prevent that debacle. The governor says he had been led to believe the Cover Oregon program would work. But how come he believed this when the news was full of reports that it wasn’t working? He doesn’t know. According to the Associated Press, Kitzhaber said on Jan. 30 he won’t know who misled him about the Cover Oregon website and what went wrong until he hears back from a technology firm he has hired for $228,000. This is bad. Our governor is helpless to remember — or to root around among his own advisers to find out — who told him that everything was going great? Not even the ludicrous “Long Live Oregonians” ad campaign, intended to raise awareness of the Cover Oregon program, gave him a clue that nincompoops were running the ship? Politics at its very bottom. Tell them & promise them anything! When Kitzhaber was out of office he could speak eloquent about his ideas. Keep feeding the masses what they want to hear to keep the name up front. It must work as voters have a very short memory span & chose to overlook his first (8) pathetic years in office. Safest bet yet…claim ignorance & blame those below you. And voters buy into it. Kitzhaber is one of the best things Oregon has going for it. Of course, his being a Democrat is enough cause for all the rural conservatives to hate him. Hasso, I doubt you being of a “certain age,” and I say that cautiously because I am older than you, would know the ins and outs of a big computer project that involves many programming geeks. Kitzhauber’s people told him, he says, that the problems would not stop the Health Care Plan from rolling out successfully. That wasn’t the case. They are now trying to clean up the mess. Let’s move, on, people. Well Ms Brock, I think “clean up the mess” means sweeping it under the rug. Four months later and Cover Oregon is still not working so, how do you move on? After Cover Oregon met with participating insurance companies in November my health insurance agent gave me a very glowing report and was trying to sign up my employees. He was back in December to tell us he had been misled. He is too kind to say that he had been lied to. Being rural and conservative I am more inclined to being disappointed, rather than hateful and I am disappointed in your representation of my attitude.